Artlyst has attended Steven Claydon’s second exhibition at Sadie Coles HQ, where surprisingly the viewer is met with the acrid smell of plastic as they enter The Gilded Bough, a display featuring a series of sculptures and installations in which the artist examines the notion of the counterintuitive idea that cloaking an object might allow it to be seen more clearly. 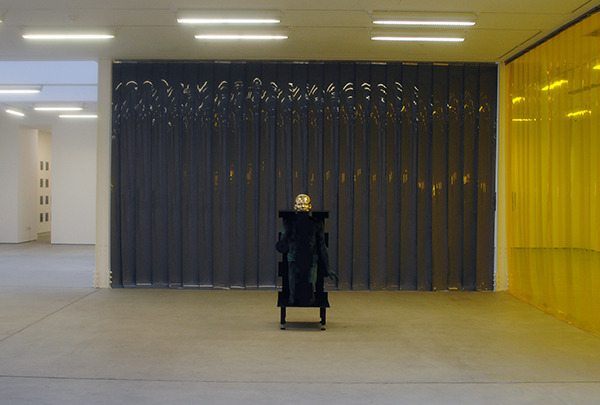 Image: Steven Claydon, The Gilded Bough, installation view, Sadie Coles HQ. Photo: P A Black © Artlyst 2016. Cloaking is a paradox found in the process of scanning electron microscopy, where samples are typically coated in ultra-thin layers of gold before going under the microscope (the conductive material increases the quantity of ‘secondary electrons’ that can be detected from their surfaces). Using gold plating as a material and a metaphor, Claydon equivocates between the surfaces and essences of objects. Gilding becomes a means of scrutinising. The exhibition’s title refers to James Frazer’s The Golden Bough (first published in 1890), a seminal work of late-Victorian anthropology. Frazer’s understanding of ritual objects – as materials in which some special nature or aura may reside – offers an analogy for Claydon’s conception of the cultural artefact, in which meaning and materiality are suspended in an uneasy dialectic. In The Gilded Bough, classical statuary, roughhewn timber, votive items and other objects appear in a variety of real and synthetic forms. Each oscillates between the status of an autonomous vessel and a vehicle for narratives. By misquoting Frazer’s title, Claydon raises the idea of the alchemical mutations or degradations suffered by cultural artefacts over time. Certain works profess their own artifice (for instance, a timber beam proven false by its hollow ends): the solidity of gold is here supplanted by the ersatz quality of gildedness. Image: Steven Claydon, The Gilded Bough, installation detail, Sadie Coles HQ. Photo: P A Black © Artlyst 2016. Gilding in fact recurs as a symbolic and literal conceit, expressing the idea of projecting a potentially deceptive beauty or sanctity or financial worth onto an object. Weaving between the arcane and the technological, Claydon draws unlikely and improbable juxtapositions. In so doing, the artist recalls Frazer’s intuitive and cross-cultural mode of anthropology. 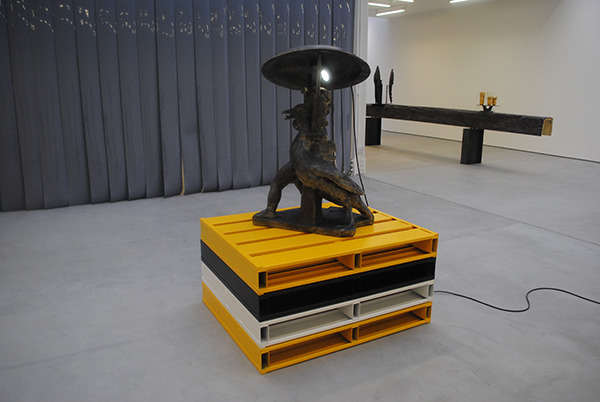 Steven Claydon (b. 1969) lives and works in London. He studied at Chelsea School of Art & Design and Central Saint Martins, London. He has exhibited internationally, with major exhibitions including Analogues, Methods, Monsters, Machines, CAC Genève, Geneva (2015); The Fictional Pixel and The Ancient Set, Bergen Kunsthall, Bergen (2015); Culpable Earth, Firstsite, Colchester (2012); Mon Plaisir…Votre Travail..,.La Salle de Bains, Lyon (2011); Golden Times, Haus der Kunst, Munich (2010); and The Ancient Set and The Fictional Pixel, Serpentine Pavilion, London (2008). 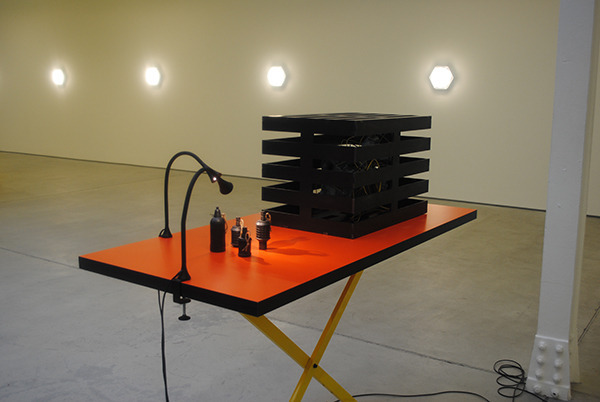 In 2015 he curated (with Martin Clark) The Noing Uv It, at Bergen Kunsthall, Bergen; and Strange Events Permit Themselves The Luxury of Occurring at Camden Arts Centre in 2007. His films Grid & Spike and Mimicry Systems were broadcast as part of ICA’s Channel 4 Random Acts in 2013. 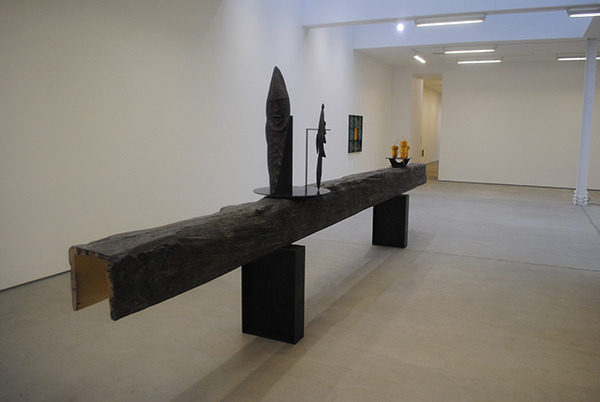 Lead image: Steven Claydon, The Gilded Bough, installation view, Sadie Coles HQ. Photo: P A Black © Artlyst 2016. Photos: P A Black © Artlyst 2016. 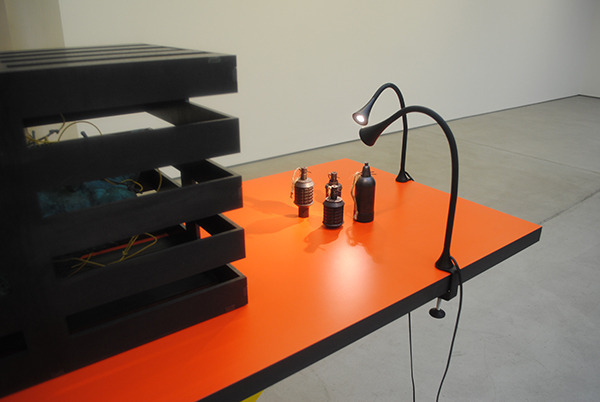 Steven Claydon: The Gilded Bough – Sadie Coles HQ – until 2 April 2016.